Acacia iteaphylla or the Flinders Range Wattle is a medium sized shrub that will grow to a maximum of 5m in height and width. 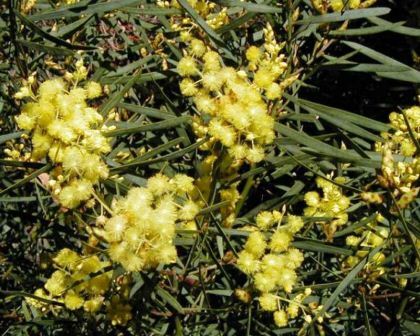 It has lovely narrow grey-green phyllodes, drooping branches and showy pale yellow flowers. It is a hardy plant and will grow in both sandy and clay soils; in full sun or semi shade and once established it is drought, frost and lime tolerant. Soil: Will grow in well drained soil - both clay and sandy. Maintenance: Prune to maintain shape. Ron - Perth WA: Best time & method of pruning? Can you help please..
Webmaster - Sydney: If your plant is young then you can do some aggressive formative pruning to help it grow to the shape you want. However if it is established then its best to not prune it too hard - rather more just trim to keep it neat and also remove dead, diseased or damaged branches. You can also remove inward growing branches or others that have grown to rest/rub on others. Its good to remove these as they cause abrasions and create an ingress point for pests and diseases. As with all plants, ensure you trim/prune after flowering..